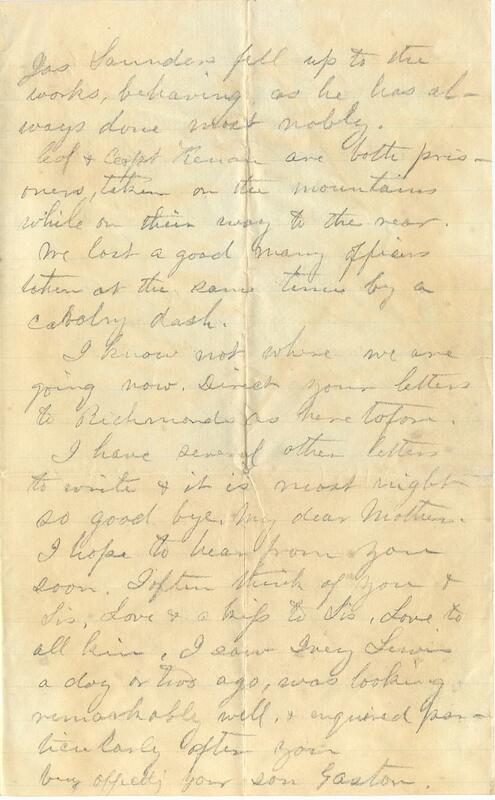 Item Description: In this love letter from 15 July 1863, William Gaston Lewis writes to his future wife (they were married in 1864) Martha Lucinda Pender (Mitte) after the Battle of Gettysburg. In it, Lewis mentions his promotion due to his commanding officer’s capture, his disapproval of the invasion policy, and, most frequently, his love and missing of Mitte. I am glad to inform you that I am safe in Va again after going through, untouched, the most terrific and sanguinary battle of the war. Are you rejoiced or not to hear it? I will not give you any account of the battle for I suppose you have read all the accounts in the newspapers. Col Kenan was wounded and taken prisoner, so I am now in command of the regiment. Will you think I am wanting in nerve if I tell you that I feel much relieved since I have returned to the sacred soil of the South? I am and always have been opposed to invasion, and I think this trip will make our authorities believe that invasion is the wrong policy, for it is impracticable. 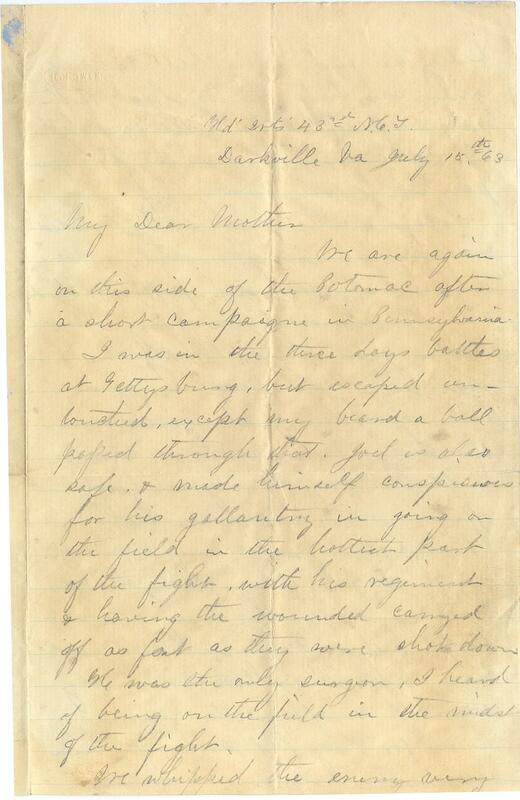 Both sides got the worst of the fight at Gettysburg, and both fell back. I am getting very anxious to hear from you, for it has been a long time since I have had the pleasure of perusing a “little story” from you. It is a great privation to me to be cut off from communication with one I so much love; But it will be better now, My dear; You must write immediately and direct to Richmond. I will get it. There is no danger of letters being captured. A great many have been received by this brigade even in Pa. I have written to you twice since I left Fredericksburg. I hope you received them, for you know I hate to waste my energies even in as good a cause, as writing to you. I am getting weary about Tarboro again, since the enemy made that raid to Kenansville. They can easily go to Tarboro on such an expedition, and if they do I will be very anxious about you. I saw a lieut in the 32nd Regi a few days ago who said he knew you very well and saw you about the middle of June. I was glad to hear him say you were well. I was very much inclined to ask him particularly concerning you, but I was afraid he would suspect something. He spoke very highly of you and Lizzie, but I think Miss Nellie Pender has his heart. He went into raptures over her. I am sorry that Maj Lewis of the same regiment was as severely wounded in the face by a shell. He was decidedly good looking and as clever as the rest of the family. I had chosen him for Laura. His father lives in Edgecombe now, and I think he will settle there. I saw Fred to day and smiled with him. He was looking well but said he was a used up man. I often think of you. I compare my present hardships with the pleasant moments I have spent with you, and look forward with pleasure to a repetition of those agreeable minutes. I am somewhat smaller than Mr. Bob Bridge now having fallen off some twenty or thirty five pounds of late on account of starvation and sickness, though I have not been off duty. Give my love to the family. And be certain to write for I am half crazy to hear from one I so much love. Farewell. May Heaven protect you. 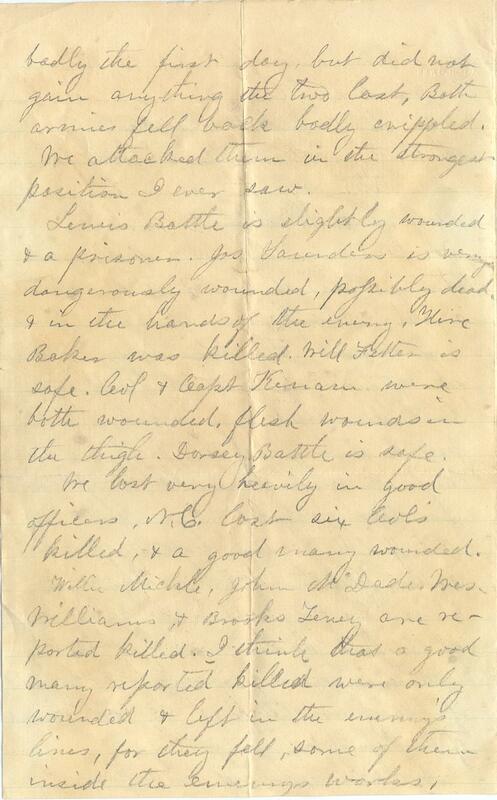 This entry was posted in Southern Historical Collection and tagged Battle of Gettysburg, love letters, Richmond, Tarboro. Bookmark the permalink.